Hey everyone Bill (Engel762) and I did some end of the month shopping and went to our usual places and tried to find a new place that didn't exist. We first started off at Half Price Books where I picked up in trade (for my Roger Waters: Live at The Wall CD Set) a few comic books at $0.50 a piece (not pictured sorry. I also picked up a few clearances GameCube games as well. Then we went to Gamers and I got two Halo Promotional items a Halo: The Anniversary Edition Promotional Box and Halo 4. Then behind the counter were a few games mostly damaged stuff but Bill and I spotted a few games I picked up Karate & Time Pilot (Which is kind of scarce, and I so wish it was the rare Karate game) both are for the Atari 2600. Then we went one of our favorite places on the way home and I picked up Whomp 'Em on the NES in a trade with Bill. So not much for me but keep an eye out on Bill's page the market is getting kind of dry here sometimes I wonder why? *Whomp 'em - $15.00 - CB - I need a manual if anyone has one. Wait... that's it?! This is all you could drum up for the end of October? I am very disappointed in you, young man; you've proven yourself capable of far more than this in the past. Hopefully, this was just a down period, and you can get back into your usual stride. I'm probably not one to talk, though-- I've come up with bupkis over the last week. @Zagnorch: It's just a down period catching up on bills and stuff and someone dried up the market here a little bit. But Bill did a nice job yesterday overall. I hope to get back to my usual stride eventually once things start showing up. I am thinking about getting rid of a bunch of DVD's especially ones I have purchased on Blu-Ray and get some extra cash. You'll find some stuff soon keep on hunting as they say. @GamerNick: I hear ya about the market drying up a bit; I've hardly found diddley around here for the last several days. What little I have found and considered buying ended up being in deplorable condition. But, the holiday shopping season is coming, which usually means a larger stock of used goodies at my fave second-hand media sellers. Just gotta be patient is all. @Zagnorch: Yup! As they say "Patience is a virtue" but with the holiday's you should pick up some good stuff. I am trying to get some boxes for my systems I need a couple more NES ones, Genesis 1 & 2 but lately I haven't had any luck for a while there Gamers was just giving them away but I think I picked them clean. 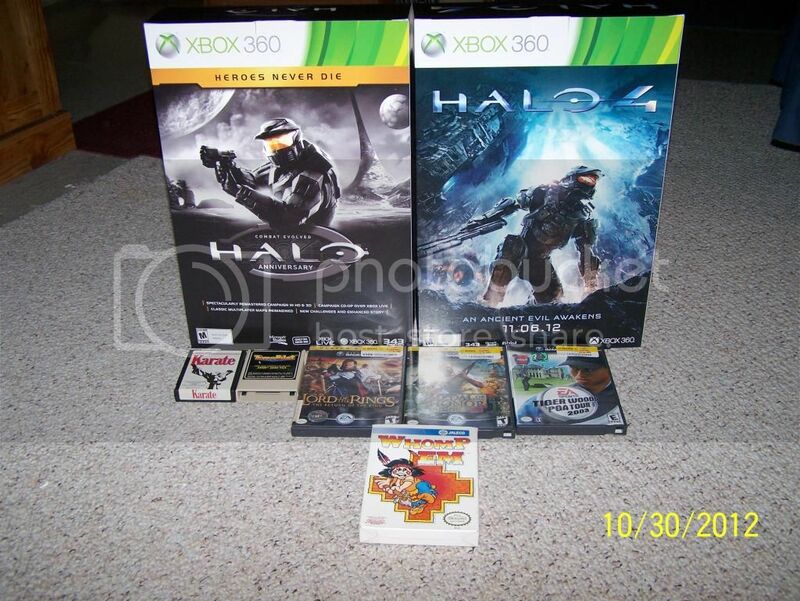 But as you said the holidays so maybe I will get lucky with those and some more boxed NES games but I also have Halo 4 Limited Edition Game & Guide coming my way on Tuesday!